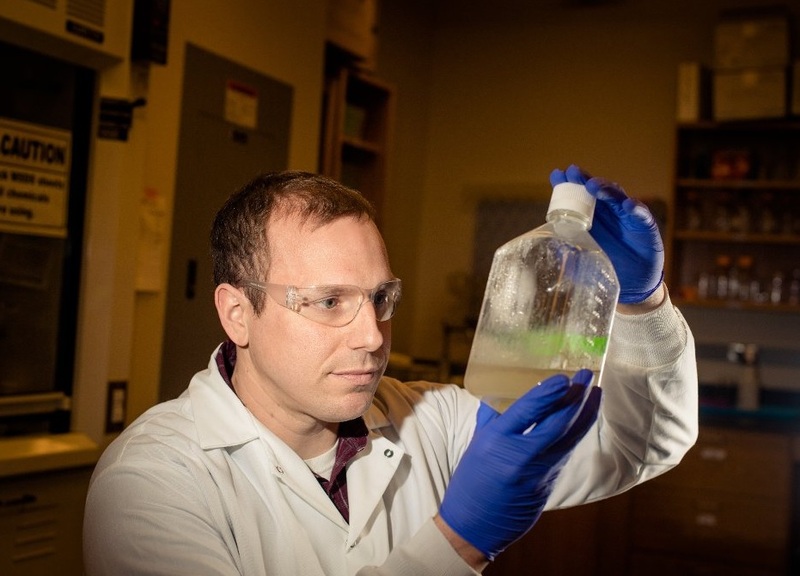 HOUGHTON — Microbiologist Steve Techtmann, pictured above, has won a federal research award to study microbial biosignatures that identify what waters ships traverse. Techtmann, an assistant professor in biology and researcher at the Great Lakes Research Center at Michigan Technological University, is looking for a single microbe. Or rather 22 of them. At each port he visits around the world — from Singapore to Rotterdam to Green Bay — he hopes to find a unique microbe species in each place. If the microbe’s genome is distinct enough, then it could be used as a marker to see where ships have traveled. Eventually, the technique could be used to enhance defense as well as environmental monitoring. The work is part of Techtmann’s prestigious Young Faculty Award grant funded by the Defense Advanced Research Projects Agency. He will be traveling this summer and fall to gather water samples from ports and ship bilges from 22 ports around the world. His work started closer to home with ports around Lake Superior. Keeping tabs on ships is currently monitored via satellite trackers. But they are only required for large vessels — it’s industry standard — though some smaller vessels have this tech as well. But it’s not a perfect system. Much the way every person has a unique microbial cloud around them, ships might also carry distinct microbial signatures. The key is testing the right waters. The bilge is in the bottom of a ship, and whether it’s a freighter or sailboat, all ships collect some external water. To sort out what microbes are found where, Techtmann and his research crew will gather 30-50 samples from the 22 ports they’ll study. In many microbial studies, as few as three or four samples can be used to examine the microbes in an environment. But to sort out what microbes are signature species and which ones are also present in bilge water — and then to compare all the various ports to see if there’s overlap — requires extra computing power and therefore more samples. Techtmann won’t be sorting out microbial samples by hand and microscope, Leeuwenhoek-style. Instead, with a larger sample set, he will be able to glean thousands of data points from the genetic codes of key microbes in a sample — and then run the data past a computer that looks for patterns. This combines machine learning, which is the same technique used for face recognition in photos and teaching AI to register emotions, as well as genome sequencing. This could lead to what Techtmann calls “spatial sensors” where identifying key microbes provide insight into the interface between biology and geography. Microbial spatial sensors could potentially be used to assess whether a wetland is fully recovered or to monitor a contaminant’s spread. Determining the microbial biosignatures of ports around the world is one way to see if this hypothesis holds up — or if it goes out with the bilge water.